All-in-one storage solution for moms on-the-go, now designed to store both liquid and dry! A must have diaper bag essential to store, dispense and organize formula, cereal, snacks, water, extra juice, pacifiers and more in one convenient unit. Put an end to a diaper bag mess or endless search for the items you need. Twist-to-Seal design allows you to stack and interlock multiple containers while quality construction allows each use as simple as it can be. 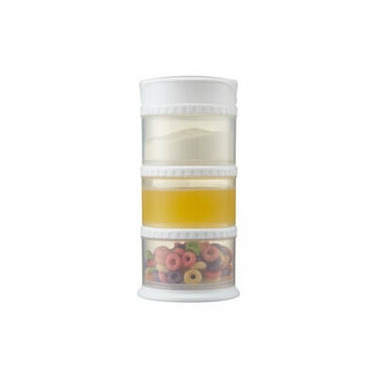 3 Tier Set Includes: 3 Containers, 3 Dispensing Lids, 1 Cap, and 1 Base.